Let's get to a review of the top half of the drivers standings **Following the same guidelines as the Nascar 2013 Quarter Season Review I will take a look at where I think the drivers are at this point in the season. I will include which section I had them in at the Quarter Season Review as well as many drivers have been moving and shaking. **On Vacation (Drivers In)Jimmie Johnson (Quarter Season- On Vacation)- Well no where else for JJ to be, he is in the Chase already and he is just trying to smooth everything out.Carl Edwards (On Vacation)- I still think Carl is in the Chase no matter what. He is 3rd in the points with a win on the season so he is no lock but he has been pretty consistent.Matt Kenseth (On Vacation)- He has four wins on the season which ties him with JJ. On the Quarter Season Review he has two wins. He is in on wins alone but he should get a top 10 spot.Kyle Busch (On Vacation)- Well he still has the two wins he had in the Quarter Season Review and they still look good for the Chase. He has had some hard luck but still sits 7th and I think he will get a top 10 spot, if not he will for sure get a WC spot with the two wins (most likely will find at least one more before the Chase).Kevin Harvick (Work to be done)- Well he is a big mover in the Half Season Review but I did have him as the safest driver in the Work to be done section. 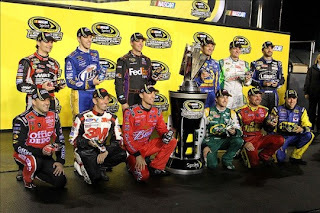 He now has two wins in 2013 and is 4th in the standings.Clint Bowyer (Sitting Pretty)- Well Bowyer is the lone driver in this section without a win after moving up from the Sitting Pretty Section in the Quarter Season Review. He is second in points and is bound to find a win in 2013, maybe he will even find that win in the Chase and make another run at a title.Sitting Pretty (Looking good but could use some work in the next quarter)Dale Earnhardt Jr (Sitting Pretty)- He is practically in, but he still doesn't have that win and at times he has been just too quiet. He is 5th in points and should lock down a top 10 Chase spot.Greg Biffle (Work to be done)- Well Biffle has been much better in this quarter and found a way to get a W. He is sitting 8th in points right now but is trending the wrong way and it could mean he may slide out of the top 10.Tony Stewart (Starting to worry)- Well he was almost cast off last time I reviewed the season but he made a strong run and found a win in 2013. He is 10th in points right now and just finished 2nd at Daytona. Work To Be Done (In the top 12 right now, but need to get moving)Kasey Kahne (On Vacation)- He literally took a vacation when I wrote the last article and he has slipped to a WC spot. Well unfortunately for Kahne he has one win and that WC spot may need multiple wins. Also, fortunately for him he still has time and has been fast time to time. 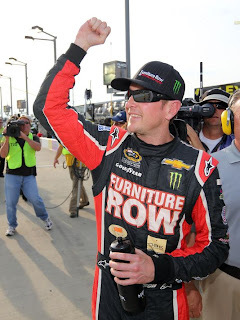 (12th in standings).Kurt Busch (Starting to worry)- Well back then I thought the little team that could may not be able to find a way to get in, and he has been on the uphill since then. I still am not sure if he can get in but the fact is he has been fast and is sitting 9th in points.Martin Truex Jr (Sweating it)- Well he was sitting outside the top 10 during the last review, and didn't have a win in over 200 races. Now Truex has a win and holds a WC spot. I think he could be a guy who has to worry about dropping out, but he has shown resilience and made the Chase last year so he can get it done.Sweating it (Guys outside the top 12 who have a decent shot but need to get going)Jeff Gordon- Well Gordon isn't out of it yet, but he would love it if he could stay away from trouble. He has seemed to be getting it going as of late and that bad luck is the only thing in his way from making a run.Joey Logano- Still on the verge of breaking out, JoLo is having his best year of his young career and is just outside the top 12.Brad Keselowski- He has totally fallen off the grid but he still has a shot at the Chase which is amazing in itself. BK needs to find a way to finish strong and pick up a win or two.Ryan Newman- Well he has been the more consistant driver between him and Smoke but he hasn't goten hot like Stewart did. He has a bit of a good track record at Loudon so if he could pull off a win it owuld make it interesting in the Stewart-Haas camp. 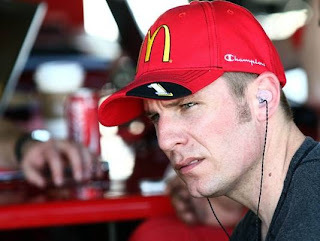 Starting To WorryJamie McMurray- Well he is starting to get hot, so he could end up being the big mover out of this group. On that note, we head into Loudon for a race where he only has one top 10 in the last 10 races.Ricky Stenhouse Jr- Ricky isn't going to make the Chase, so he may as well be in the "Pack It Up" section. I gave him the pass for now because he is a rookie and he still does have a chance if you look at the points. Having a nice rookie year, he seems to always finish from 14-19th every week.Aric Almirola- He has a nice run where he posted top 10's but it seems like that has faded and he and his RPM teammate -Marcus Ambrose- are on the outside looking in when it comes to the Chase.Pack It UpDenny Hamlin- Well he is done. He just keeps finding the wall and when you find the wall your chances of wins and top finishes goes down the drain. I do however think he can notch a win this season (I actually have him this week as a front runner at Loudon).Paul Menard- Bad luck did Menard in at Daytona this last week and he was out almost before it started. He had a good run early this year sitting in the top 10 but he has faded and he now is all but out of contention -picking up 1 point will do that to you-.Who I like to get in at this point in the season (Also added in who I liked at the Quarter Season Review and Current Standings) Quarter ReviewHalf ReviewCurrent Standings1Jimmie Johnson1Jimmie Johnson1Jimmie Johnson2Kyle Busch2Matt Kenseth2Clint Bowyer3Matt Kenseth3Kevin Harvick3Carl Edwards4Dale Earnhardt Jr4Clint Bowyer4Kevin Harvick5Carl Edwards5Kyle Busch5Dale Earnhardt Jr6Brad Keselowski6Dale Earnhardt Jr6Matt Kenseth7Clint Bowyer7Carl Edwards7Kyle Busch8Kasey Kahne8Kasey Kahne8Greg Biffle9Kevin Harvick9Greg Biffle9Kurt Busch10Jeff Gordon10Joey Logano10Tony Stewart11Greg Biffle11Martin Truex Jr11Martin Truex Jr12Ryan Newman12Tony Stewart12Kasey Kahne *No real order, but it is kind of by who I think is the safest as of today 7/11/13. *Some notes on the Chase Standings:I had Gordon being the big mover between he and Smoke and was wrong. Gordon still has a shot and if I ranked them I would have him 13th.With his win I think Truex will get in, but he is a risk because the WC spot may go to a guy with 2 wins.Kahne is struggling right now but his win and the fact he has been fast (plus he is a Hendrick car) leaves me thinking he will make a run. I have Kurt Busch dropping out of the standings as my only mover. Joey Logano meanwhile is the guy who moves into his spot.Well that's it for now. The next 8 races are crunch time for drivers and we will know more each week as we get closer to the Chase, the key will be wins. Will Kenseth and Johnson keep stealing wins? The more they steal the more it looks like one win will get a WC spot with a lot of guys fitting that category and making a crazy last couple races.